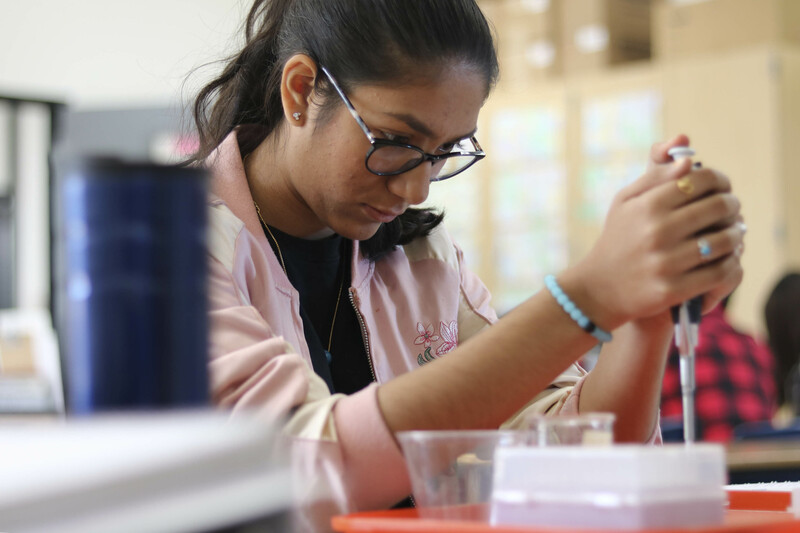 Santa Susana High’s Scientific Modeling and Inquiry Pathway is the standard for cutting edge career and college training. With the 2018 Ventura County Engineering Teacher of the Year, and 3 Amgen biotech trained teachers, SSHS continues to send its graduates on to first-class institutions such as Johns Hopkins University, UC Berkeley Engineering, UCLA, and Duke University, among others. Our top-ranked robotics teams smother competition across the Southland and our students work hand-in-hand with JPL and NASA engineers. Currently, students are working on a submersible drone project with the United States Navy. The Applied Science Series seminar students continue to produce our renowned Distinguished Speaker (Med-X) Series, STEAM Exposition, and Astronomy Night. Our students from our Science Fair have taken 1st place medals in both the 2017 and 2018 Ventura County Science Fair. If exciting hands on STEM is your thing, Santa Su is the place to be. The Scientific Modeling and Inquiry Pathway develops real-world problem solving methods through hands-on laboratory learning. The rigorous courses and exciting options allow students to explore all of the domains of science, and to explore the myriad of sub-fields. Science at Santa Su embraces the innovative thinker. The small nature of the school and its close-knit community inspire each other to strive to achieve previously thought to be unachievable goals. Students from our pathways find themselves well prepared for any four-year university or college in the country. This course illuminates the, possibly not unique in the Universe, Earth’s systems while providing background to the SSHS STEM pathways. Using the principals of physics to examine key components of Earth’s structure and composition, plate tectonics, resources, weather/climate as well as Earth’s formation, this course is an exciting challenge for students wishing to expand their knowledge in all, and any, STEM fields. Students confront current issues involving Earth and its environment. College style lab research is stressed, in order to prepare students for the rigors of a four-year university. C.P. Chemistry is a year-long, lab oriented course for science and non-science majors. This course will put students on a path to success in their future college chemistry class. Students will participate in laboratory experiments, in addition to viewing exciting teacher demonstrations. Students will learn about chemical bonding, structure of atoms, periodic patterns, reactions, stoichiometry, gas laws and more. All of which are required in many fields, from plumbing to aerospace. Honors A&P is a detailed study of the structures and functions of the human body. This course is intended to provide a strong background in human anatomy and physiology for students who have an interest in medicine, nursing, science and related health fields. Students can expect to participate in reviews of real-life case studies as well as dissections of assorted specimens, such as brains, hearts and more. CP Biology is a year-long, comprehensive science course covering the fundamentals the characteristics of life on Earth and how organisms function individually and in concert with other organisms and the planet. This is a course for science and non-science majors. How living things acquire and use energy, reproduce, grow, genes, human genetics, and DNA technology are among the topics covered. The world faces an unprecedented need for innovators, problem solving leaders and thinkers. Robotics and Engineering is a course whose objective is to introduce students to the field of Robotics and stimulate their interests in science and engineering through the participation of the entire engineering design process. This course covers a variety of multidisciplinary topics necessary to understand the fundamentals of designing, building, and programming robots. Students learn hands on skills including soldering, circuit design, Arduino programming introduction to Python programming language and working in our state of the art maker space learning how to use hand and electric tools. Students will work with Autodesk Tinkercad to design and 3D print their projects on our state of the art resin and filament printers. Students will also work on 2D CAD designs and complete their projects on our CO2 laser cutter/engraver. During this course, students will be required to gradually complete the design and construction of a robot using the Vex Robotic System kit and following the constraints and objectives compete on their final project demonstration. In addition, students will complete the construction and programming of the SeaGlide Underwater Robot designed by teams from the United States Navy. Are you excited for your introductory journey into Robotics and Engineering? AP Chemistry is designed to prepare students for the AP Chemistry exam, and covers the equivalent of one full year of college-level general chemistry. AP Chem. has a strong laboratory component. Why take AP Chem? College-bound science majors will likely be required to take at least one year of chemistry, regardless of what science-related major you choose; you can complete it here at SSHS. College-bound, non-science majors will likely be required to fulfill a physical science requirement (in addition to a life science requirement, etc.). Why not fulfill that requirement here by taking AP Chem. at Santa Su in the bosom of your family? Go to mrthaler.net for more info! APES is interdisciplinary; it embraces a wide variety of topics from different areas of study. APES provides students with the principles, concepts, and methodologies needed to understand the natural world, to identify and analyze environmental problems both natural and human-made, to evaluate risks associated with these problems, and to examine solutions for resolving and/or preventing them. Because APES is designed to be a course in environmental science rather than environmental studies, it includes a laboratory and field component, whose goal is to compliment the classroom portion by allowing students to learn about the environment through first-hand observation. Go to mrthaler.net for more info! AP Physics 1 is an algebra-based, introductory college-level physics course that explores topics such as Newtonian mechanics (including both translational and rotational motions); work, energy and power; momentum and collisions; mechanical waves and sound; and simple circuits. Through inquiry-based learning, students will develop scientific critical thinking and reasoning skills. A major component of this course will be hands-on laboratory work, with an emphasis on inquiry-based investigations that provide students with opportunities to apply the science practices. This course, offered only at SSHS, is an algebra-based, introductory college-level physics course that explores topics such as fluid statics and dynamics; thermodynamics with kinetic theory; PV diagrams and probability; electrostatics; electrical circuits with capacitors; magnetic fields; electromagnetism; physical and geometric optics; and quantum, atomic, and nuclear physics. Through inquiry-based learning, students will develop scientific critical thinking and reasoning skills. A major component of this course will be hands-on laboratory work, with an emphasis on inquiry-based investigations that provide students with opportunities to apply the science practices. AP Physics C-Mechanics covers Newtonian mechanics (including both translational and rotational motions); work, energy, power; momentum and collisions; and mechanical waves. All of these topics are covered on a calculus level. Through investigations, demonstrations and labs, students observe natural phenomena, propose hypotheses and generate descriptions. Ideas are tested and foundations are laid for fundamental laws, theories and formulas. These concepts and formulas are then used to solve problems and are applied for predictions that are tested and evaluated. Using graphing calculator technology, students experience the rich level of description, analysis and problem solving that physics provides. In addition, they experience the wonder of the science and nature and learn to appreciate the poetic descriptions of the Universe offered by many scientists including Galileo Galilei, Johannes Kepler and of course Isaac Newton. This course, offered only at SSHS, is unique in that it gives aspiring engineers early access to sophomore level of college physics.) Topics include electrostatics; electrical circuits including RC & RLC circuits, magnetic fields and electromagnetic induction. This course is intended for students who have a thorough knowledge of pre-calculus mathematics and AP Calculus AB. The content is intensive, analytic, and places strong emphasis on solving a variety of challenging problems, some requiring calculus. It builds on the conceptual understanding attained in AP Physics C (Mechanics) and serves as the foundation in physics for students majoring in the physical sciences or engineering. Methods of calculus are used in formulating physical principles and in applying them to physical problems. Graphing calculators will be used throughout the course to aid in the solution of problems. Recognition Certification requires 10 Science units beyond graduation requirements. An Honors level certification requires 20 units beyond graduation requirements. The Highest Honors level certification requires 30 units of science beyond graduation requirements. All certifications require 4 years of science with one class of AP or Honors coursework. A minimum of 3.0 GPA is mandatory. Must complete a senior project. All courses in the disciplines of Science are 10 unit, year long course.